The Mexican resort of Puerto Vallarta is situated on a 14 mile long bay that is lined with fabulous stretches of white sand beaches. Despite it being the second largest resort on the Mexican Pacific coast it has managed to retain its traditional character. With luxurious resorts, great restaurants and a variety of shops it is a perfect choice of holiday resort. Holidays to Puerto Vallarta have really become more accessible in recent years thanks to new aircraft allowing for direct flights from the UK. Luxury hotels along with restaurants, bars and shopping centres have spread from the original town right along the gorgeous coastline that is lapped by the Pacific Ocean and blessed with gorgeous beaches. The cosmopolitan resort has a traffic boardwalk called El Malecón that is the beating heart of the city. Local street artists and musicians entertain locals and tourists alike who enjoy the atmosphere by having a drink in one of the nearly 250 restaurants or bars in the centre. The beaches are at the heart of most people’s Puerto Vallarta holidays, the fine soft sand offers an inviting place to enjoy the sunshine or the chance to enjoy one of the many diverse watersports on offer. Scuba diving is very popular, but snorkelling is also a popular pastime straight off the beach. Boat trips are a great way to spend the day and offer the chance to see the whales and dolphins that inhabit the bay. As home to the annual Gourmet Dining Festival in November it is easy to see why there are so many restaurants in Puerto Vallarta. It is said that some of the best restaurants in Mexico are based here and there is a wide choice of tasty dishes to suit all palates. There are hundreds of places to eat from beachside cafes to traditional family run restaurants as well as international cuisine such as French, Japanese and Italian restaurants. After a lovely meal the restaurants clear away and offer drinks and life music that is great for all ages. The nightlife in Puerto Vallarta comes alive with many music bars, clubs and discos catering for all musical tastes. Puerto Vallarta – Shop until you drop! Tourists love the shopping in downtown Puerto Vallarta from supermarkets to speciality shops there is everything you can imagine and more on offer. Some of the trendy boutiques sell shoes, clothes and traditional dress as well as international brands. There is an abundance of local arts and crafts, such as pottery, ceramics and hand blown glass and Vallarta is now renowned as an art centre. The local flea market is perfect place from which to pick up a reasonably priced gift or souvenir. Hotels in Puerto Vallarta are generally of high standard and based on all inclusive. Most are on the beach and have their own private section with an array of facilities and activities on offer. Laze around the pool with a cooling cocktail or take part in one of the many activities arranged by the hotel animation team. 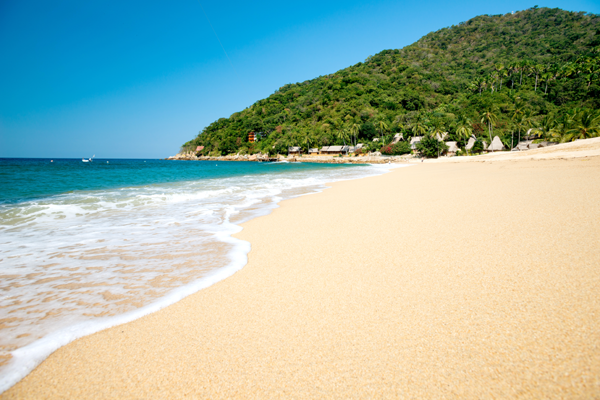 So why not take a holiday to Puerto Vallarta? Have a browse around our site or call one of our friendly Mexico experts and we aim to find you a fantastic deal today!